Society for American Archaeology meeting, Vancouver 2017The spectacular Cara Tremain and I* have proposed a session at the upcoming SAAs on the global market for Pre-Columbian antiquities. We want to talk about the past, present, and future of the interactions between the market and scholarship. To think about movements and changes in the market, short and longterm effects of artefact commodification on research, and to talk about where we go from here. All this with an eye for a) discussion and b) coming up with a special issue on the topic for an as-yet undecided journal. We think this is worthwhile and timely: we need to reflect. We’ve emailed a few people about this session already but we’d like to open it up to submissions. Are you working on a topic in this area? Do you have info, ideas, or research results to report? Get in touch. We’re asking that you email prospective abstracts to Cara (c.g.tremain@ucalgary.ca) so that we can plan this out. Please send us abstracts before 20 August. * note, Cara is so wonderful and organized. I feel like I should pretty much take no credit for putting this together at all. I’m hoping that I can redeem myself with journal issue organization! 82nd Annual SAA Meeting, Vancouver, B.C. 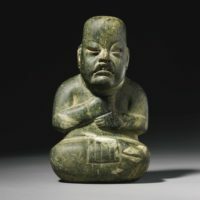 Pre-Columbian antiquities are among the most popular items in the international antiquities market. Because of the opaque nature of the antiquities market as well as the phenomenal growth of online and alternative sales platforms in recent years, it has become increasingly difficult for the scholarly community to monitor the Pre-Columbian antiquities market. Studies into this market are limited, repetitive, or outdated; we may not have a real sense of the nature and function of the current market for Pre-Columbian objects. Without this information it is unlikely that we will be able to positively influence policy in this area or effect substantive change. This session will explore past, current, and future policies and trends concerning the sale of antiquities from Central and South America. By exposing some of the developments through time, and reviewing some of the most prominent individuals and organizations that have bought and sold at auction, a clearer understanding of the current state of research into the market for Pre-Columbian objects can be achieved. Having outlined gaps in our knowledge, this session seeks to identify the substantive steps that the academic community can take towards effecting transparency, accountability, and ethical practice within the Pre-Columbian antiquities market.